New to riding this year. Wasn't sure I wanted a Harley, so went with the sport bike. I love it! Although now I also want a Harley. 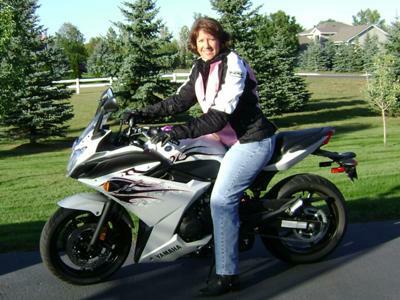 The sport bike is white with pink as the accent color and is very girly. :) It's the touring model, so I'm comfortable riding it, although I'm not sure about long trips yet. Great choice. This was my second bike and just recently stepped up to the Yamaha FZ1. Set mine up as a sport tourer, with bags, so I can take weekend trips. Love it, love it love it. Hope to see on the road or at a rally sometime! Welcome to the joys, thrills, and ultimate experiences of riding your own machine. As you become more comfortable riding, road trips will call your name!